Oito ou OItenta translated from Portuguese is eight or eighty, and this, is Gregory’s new motto. Care of Kim’s Dad. A man who we are learning must be a very wise guy. Kim is always bringing up clever turns of phrase that he grew up hearing from his father. And while the message is sometimes lost in the translation, you more than get the idea that Kim’s Dad is guy you’d want to hang out with. There’s one about a chicken eating bit by bit that is meant to convey patience that I’m left slightly confused about. Although if you think about it, I’m sure the location of where a bear does its bathroom business seems an odd affirmative answer to a question for a non-English speaking person. Back to the motto, it took Kim less than five days to correctly nail down Gregory’s more-is-more personality. He defined Gregory’s passionate extremes easily, coining the near perfect and precise phrase to cover it. See with Greg it’s either all the way good, or all the way bad in everything. No middle ground exists, ie eight or eighty. A lovely trait at the eighty end of the scale making the smallest blip in the water cause for unmatched excitement and hurrah. Though the eight end can be a rather bleak experience, not to mention riddled with profanity. But don’t assume the low-end of the scale lacks any of the drive the top end delivers. When the world is ending it receives the same attention as when the stars are aligning. 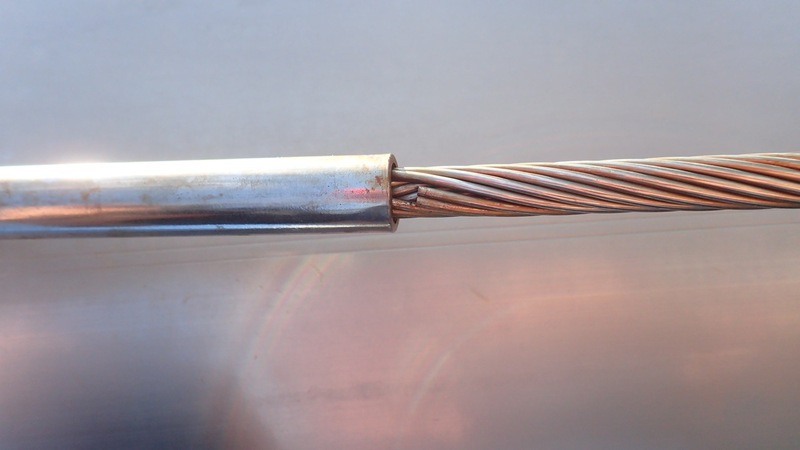 Our recent rig failure is a case and point. Gregory has attacked this problem with the same care and probably more gumption than he does with the top end, preferred choices. 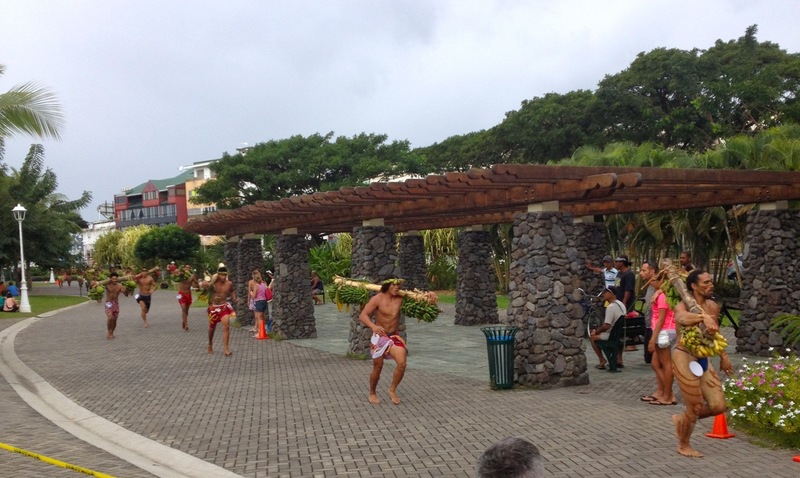 In local news, the reason we timed our visit to Tahiti for right now was so we could be around for Bastille Day on July 14, as well as, the ongoing Polynesian festivities that span the entire month of July. Today we got our first taste of Polynesian games, and I’ll tell you what, they more than merit their rightful place at the eighty end of the oito ou oitenta scale. What we watched today was called fruit carrying races. And if you think that sounds like a sissy sport, you’ll be feasting on your assumptions for ages to come. 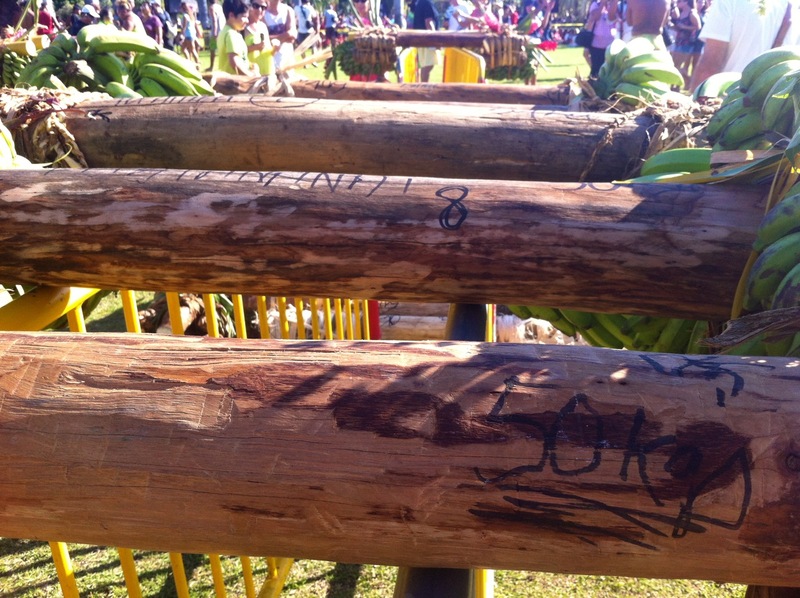 For the fruit carrying races participants first reported to the weigh scales. Here they had their custom barbell of tropical fruit weighed to sort them into the proper class. What is a tropical fruit barbell? First take a 4 inch diameter log about 6 feet long. Once you have that hefty number all picked out, take your choice of bunches of taro root, stalks of bananas, branches of breadfruit, chunks of more logs, and/or a combination of any of the above. Then using rope you’ve recently fashioned out of the leaves and bark of these items, lash a massive clump of whatever you’ve chosen to each end of your log. Voila, your very own tropical fruit barbell. Once everyone is classified into their proper weight division the racing begins. Up to 20 racers would gather at the start line where they pulled numbers for placement of their barbell on the line. Number one obviously got the primo spot on the inside corner of the line, while the unlucky final number was starting the race at a disadvantage seeded in the back of the pack. Once everyone’s barbell was placed according to the luck of the draw the racers retreated about 40 meters back of the line. The countdown began – compliments of Miss Tahiti herself! – and on the gun all the racers would charge for the line. In the frenzied rush each competitor would manage to hoist their barbell up over one shoulder and take off running at a clip. Each of the men’s races had to complete three laps of the set course. A length I’m estimating at about 500 meters each. We watched all three of the men’s races where they weight classes steadily increased from 25 kg to 50 kg. 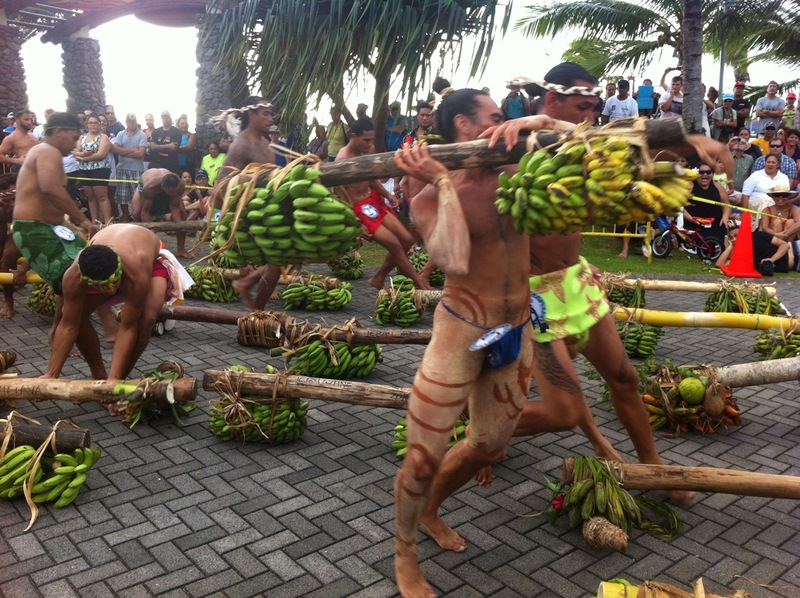 So not only where these men running 1500 meters carrying 110 lbw of weight on one shoulder, they were doing it in traditional Polynesian dress. 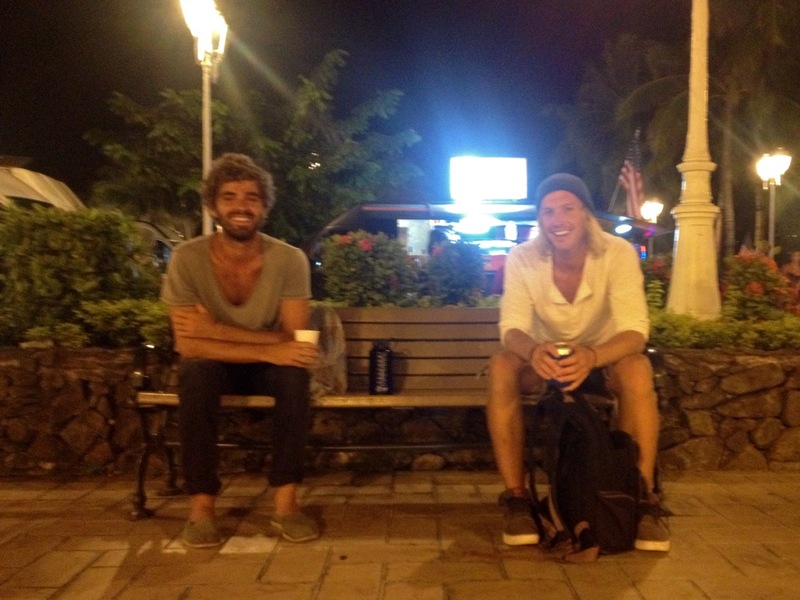 No shoes and not much of anything of else. Unless of course you count body paint as something else. To say the least it was beyond impressive. Chatting with someone in the crowd I learnt we were watching competitors from all over Polynesia proper. Teams were present from Hawaii, Rapa Nui (Easter Island), New Zealand, and many more South Pacific Islands. 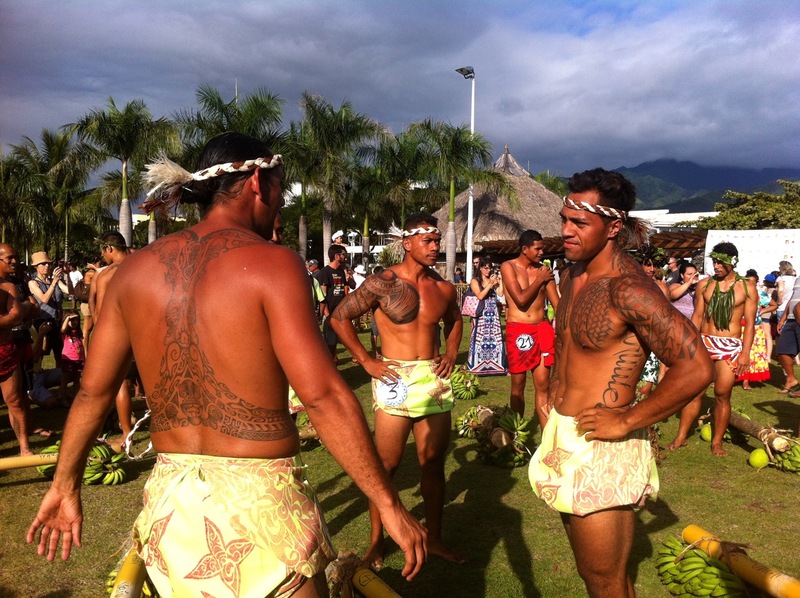 As an introduction into the festivities Tahiti had going on, this was a remarkable look at Polynesian culture. And the cherry on top? A free stalk of bananas when everything was said and done! 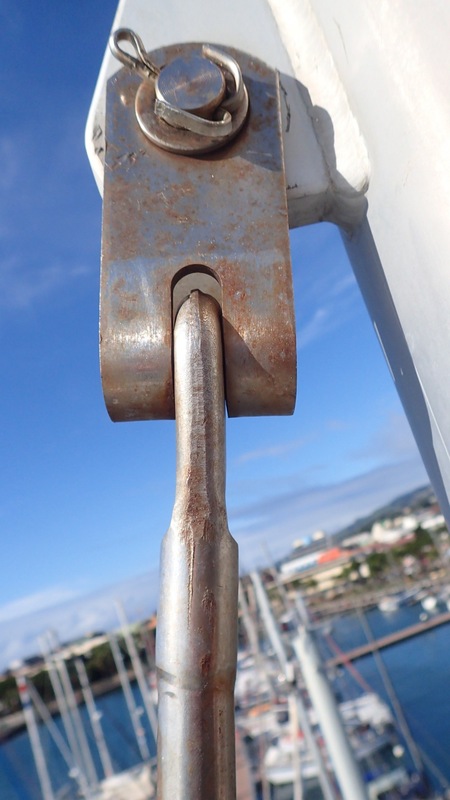 Checking the rig fittings out at the top of the mast. Couple strands not doing what they’re supposed to do on this one. 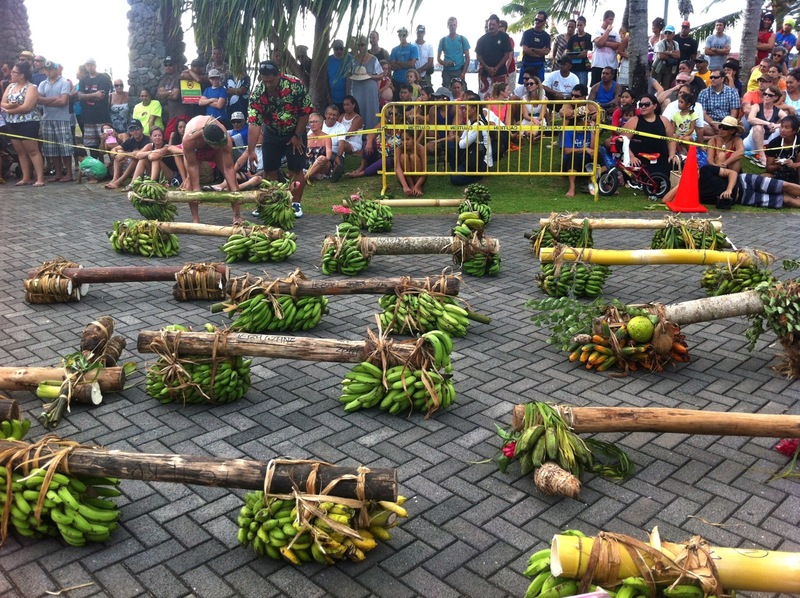 Tropical Fruit Barbells lined up after the weigh in. The last barbell getting placed at the line. Coming down the back stretch. 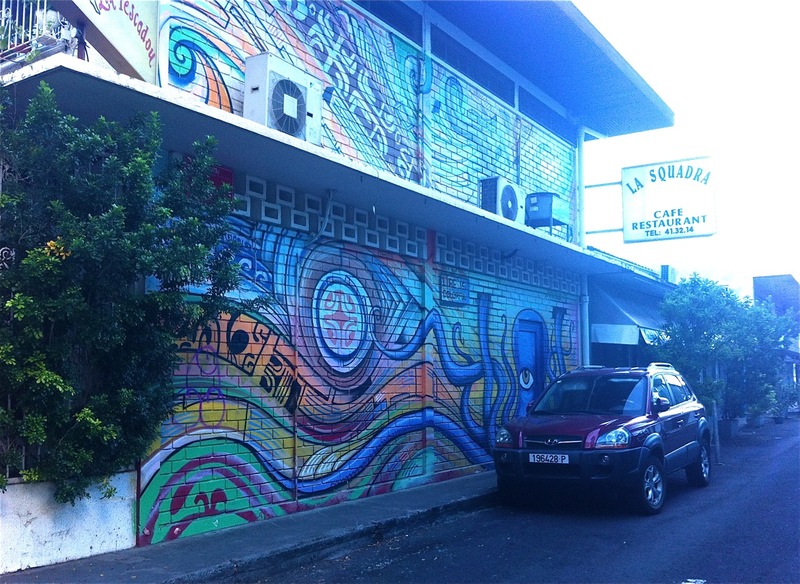 The street art around Papeete is absolutely incredible. 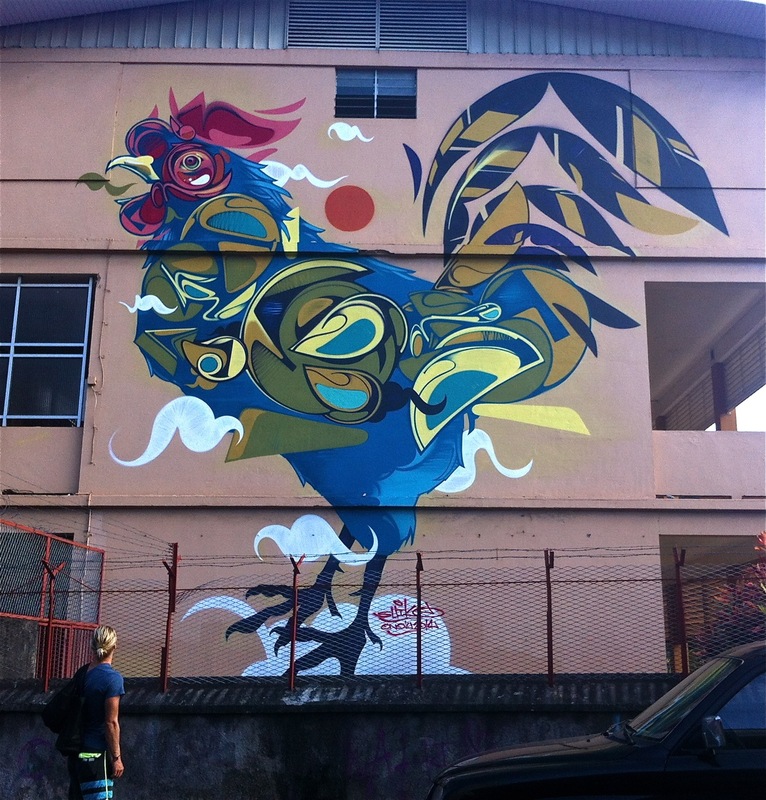 This rooster was for sure my favourite. This octopus was pretty cool too. 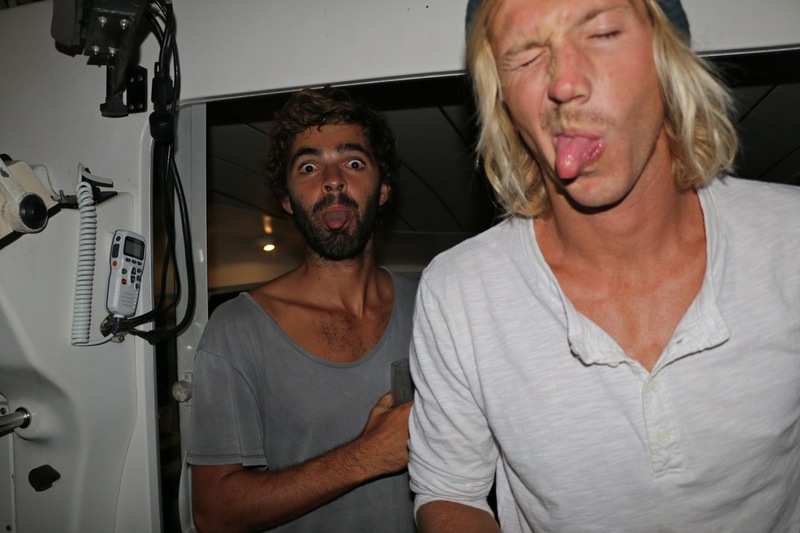 Just a couple of lookers. And we’re back at the delicious food trucks again!